Provide our customers a source for quality materials and knowledge with exceptional, professional one on one service. Since 1917, Herrman Lumber Company has supplied the area's best pro-builders with the highest quality products and services available. We have the best brand names in the business and can furnish them from any one of our many retail locations as well as our millwork division. Our knowledgeable sales staff and field representatives are what your next project deserves. Whether you are a professional builder or a weekend warrior, we can help you get the job done right, on time, on budget. 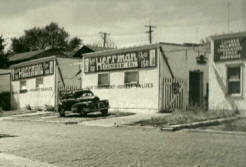 In 1917, Jess Edward Herrman opened his first lumberyard in Appleton City, Missouri, and began one of the finest family owned lumber companies. Today you'll find Herrman Lumber in multiple locations across two states. Jess Herrman's insistence on quality, integrity, and customer service has made Herrman Lumber Company one of the most trusted names in lumber, hardware, and millwork in the Midwest. Herrman Lumber Company is committed to giving you accurate job cost information, computerized estimates of materials, exact order delivery, and precise billing. We understand what you need to get the job done and are committed to making sure you have what you need, when you need it.